Here is my second autumn version of the quirky clock, which I have refurbished in a similar way to that which I did in the spring. For the method used to disassemble and reassemble the clock - please see the "Spring Forward" entry for March 2010. 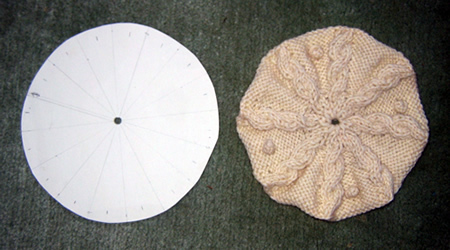 Read all those instructions first, then use the pattern here for the clock face. As before it is important to remember that if you make a thicker clock face, it may interfere with the proper function of the clock hands. This pattern is for my original visualisation of a lovely thick Aran clock, but to achieve this I had to replace the clock mechanism in the IKEA clock with one with a higher loft. The clock face is thick all over not just towards the edges, so trimming the hands is not sufficient. If you do change the mechanism like this then you have to carefully check how high you can make the hands above the clock face while still being able to fit the plastic cover over the face. Clock movements and hands were purchased from eBay. I tried both the 15mm and the 20mm shaft sizes, and settled on the latter. Original clock came from IKEA. Aran yarn was two different makes of left-overs - one for the face section and one for the edging section. Take care to match the shades of cream - there is a lot of variation in tone as well as thickness. The latter is less important for this project, just make sure you don't change yarn in the middle of one of the sections. Row 1: (Twist 2; p1) 8 times. [Twist 2 by knitting through the second stitch on the left hand needle and then knitting through the first stitch and slipping both stitches off the needle together - effectively you have cabled over 2 stitches]. Row 2: (K2; p1) 8 times. Row 4: (K3; p1) 8 times. Row 6: (K3, p3) 8 times. Row 8: (K4; p4) 8 times. Row 10: (K4, p6) 8 times. Row 12: (K4, p8) 8 times. Row 15: (K5, p10) 8 times.  To make bobble: increase by (k1, p1, k1, p1, k1) into next stitch; turn the work and knit the 5 sts; turn the work, slip 4 sts, k1, pass the 4 slipped sts over. Row 17: (K5, p11) 8 times. Row 20: (K6, p12) 8 times. Row 21(cast off): (K2tog; k2tog, pass first stitch on right hand needle over second st, k2tog, pass first stitch on right hand needle over second st; cast off next 12 sts purlwise); repeat across all 8 sections and fasten off. Return to the centre. Carefully remove the waste yarn and pick up the free stitches. Thread the tail through the stitches and pull up. Fasten off. The face is not quite flat making the effect of the cables and bobbles more overt. 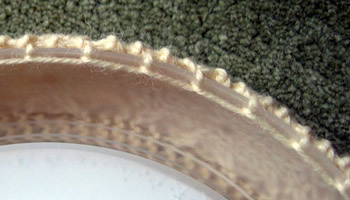 Sew in the ends and press lightly with a damp cloth, taking care not to flatten the cables. Using the plastic clock face cover as a guide, cut a circle from stiff cardboard. and make a hole in the centre. Sew the knitted face to the cardboard at the edge, which pulls it into shape. Put the clock face into the body, keeping the bobbles at the 12, 3, 6 and 9 positions. Remove original plastic mechanism (it is held in place at the back by plastic clips which are easily released) and push in the new mechanism; secure in place with the washer and small ring bolt. I had to trim a plastic loop from the back of my replacement mechanism to make it fit the housing in the IKEA clock. The clock frame consists of 12 ribbed cables each with a centre bobble. It is designed to fit tightly, (so slightly stretched), aided by keeping the edge stitches in garter stitch. I cast on with waste yarn and then grafted the stitches together - this is quite tricky, so you may want to finish by simply sewing the ends together. 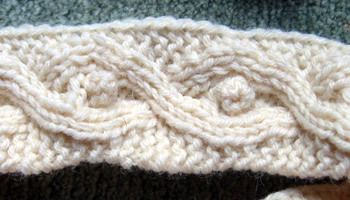 Note that the right side rows always start with a slipped stitch, and the alternate rows do not. This makes the right hand edge of the work slightly tighter. C3Lk = cable 3 to the left and knit: slip 3 sts on cable needle and leave at front of work; k1, then k1, p1, k1 from cable needle. C3Rp = cable 3 to the right and purl: slip 1 st on cable needle and leave at back of work; k1, p1, k1, then purl one stitch from cable needle. C3Lp = cable 3 to the left and purl: slip 3 sts on cable needle and leave at front of work; p1, then k1, p1, k1 from cable needle. C3Rk = cable 3 to the right and knit: slip 1 st on cable needle and leave at back of work; k1, p1, k1, then knit one stitch from cable needle. C7 = cable over 7 stitches: slip next 4 sts on to a cable needle and leave at the back of the work; k1, p1, k1, then p1, k1, p1, k1, from cable needle. Make bobble: increase 4 sts by (k1, p1, k1, p1, k1) into next stitch; turn the work and knit the 5 sts; turn the workand decrease the 4 sts just made by slipping 4 sts, k1, then pass the 4 slipped sts over. Row 2 (and alternate rows): Knit the knit stitches and purl the purl stitches. Repeat rows 3-18 eleven times more. Cast off. Join in a ring, either sewing or grafting. 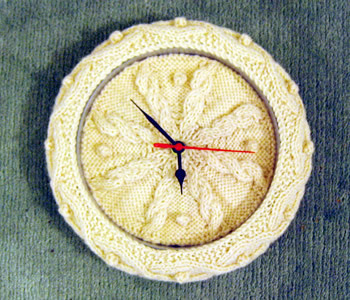 Attach the knitted circle to the clock with the slipped stitch edge towards the clock face, and attach the other side to the rim of the clock; I drilled holes around the plastic clock surround, (as before), about ¼ inch from the edge.